Agnihotra is a famous marathi daily which is aired at 9 PM on weekdays. 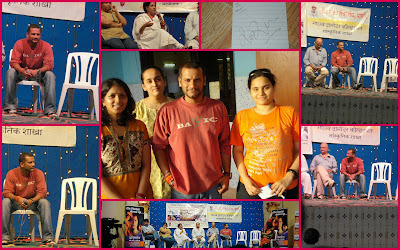 On the occassion of it completing its 150 episodes Star Pravaha had organised a talk with its directors & few of the actors at P L Deshpande Sabhagruha Vile Parle (E) at 7 PM on 13th June 2009. And this is where I got my first glimpse of the Satish Rajwade, the genuis behind many hits & commendable record breakers like Mrugjal, Oon Paus, Asambhav, Ek Daav Dhobipachad, Agnihotra, etc. I had planned on reaching the hall early so that i would be able to catch a good place to watch the show. However when I arrived I was surprised to find Satish Sir already present there. My friends & me worked up some courage to go & introduce ourselves. As the show was yet to begin we were able to catch him early & avoid all the crowd that caught up with him as soon as the show was over. I am not forgetting yesterdays evening anytime soon!!! mi punha ekda sagla athavla....amazing day of life!! !mi kalpasun phakta dole banda karun to awaz athavtiye...!!! ah!!!!! what a wonderful evening!!!! an evening well spend....without money!!!! aapan kiti nervous zaalelo tyancha autograph gyayla. I was literally shivering. pan tyani kaslach tension janavu dila naahi. Ekdum casually tyani autograph dila, photo hi kaadhu dila. Te tikde stage var baslet aani aapan tyana baghtoy ya var vishwass basat navhta. He is really down 2 earth. The way he behaved with us was really complementing & was very sweet of him. His simplicity reflected in his clothing 2 his sitting also. I just could not forget that day!!!!! This is what is called a true STAR & we were really "starstruck"
Khoop lucky aahes tu Shruti.